This system incorporates safety with innovation, making it a great enhancement to your biotechnological studies. View fluorescently stained nucleic acids and protein gels as DNA gel banding patterns are illuminated through the bright blue LEDs. An imaging hood eradicates stray light or glare which eliminates any photographical disruption and combined with the ProScope HR, a high-resolution digital USB camera with a 1-10X lens, premium gel images can easily be captured and analyzed. 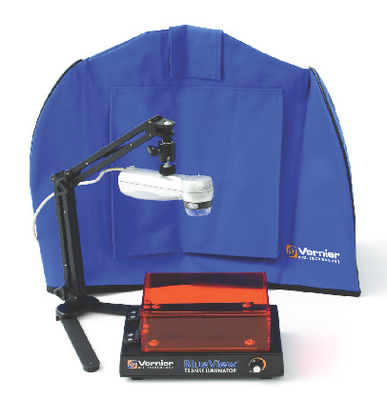 Included with the system is the BlueView Transilluminator, Imaging Hood, ProScope HR Base, ProScope 1-10x Lens, and ProScope Stand. Requires the use of stains and Logger Pro 3, available separately. Accessories information: Fully Functional with Other Transilluminators. This hood, which is placed over the Blue Digital Bioimaging System, eliminates interfering external factors such as light and reflections from reaching your gel samples so that its image quality is greatly enhanced. The hood features an access port on the top where you can observe images as well as on the side so that your students can position the gel, focus the camera, and alter the light intensity on the Transilluminator. Accommodates most handheld digital cameras.